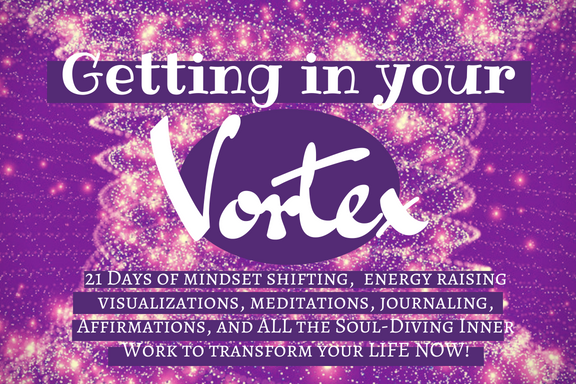 Come here as often as you are guided to and explore, play, and float in the magical, sparkly, glittery essence of your Vortex. Today is ALLL about exploring that version of you who lives, breathes, thinks, and moves with FULL faith. Faith in YOU, in the universe, in the Vortex, in PURPOSE, and in LOVE! So who is that person? Let's discuss more. Today's lesson and journaling prompts are all on the Playsheet. LIVESTREAM! The Magic of Being That Version NOW! Did you know that there's a way to instantly and INCREDIBLY switch out of the energy of fear, doubt, and resistance? Today is so good. No audio, it's all on the Playsheet. Absorb it, take it in, feel it, and then DIVE straight in. Today's the day. Now's the time. It all changes in moments like this. Today you are learning the OTHER side to flow. The side to flow that is all about getting your most important spiritual lesson. When you get it, you flow! Vortex love, baby! Let's jump in. Hi lovely~ Today is suchhhh an important message! It's a message..a TRUTH that so is not always so easy to apply in real life. We are addressing the "is this really how it's supposed to be? Really that easy? Really that...strange?" This is one of my fave topics in the world!! Pay attention to the subtle shifts you feel and experience afterwards. Today's teaching is allll on the Playsheet. Enjoy! Tuning and getting guidance is a daily thing. It's one of those things that gets better & easier the more you do it. Today's teaching is all on the audio. Hi lovely ~ Today is some real-talk on being in full-integrity, alignment, and fully in the Vortex. When you accept and love yourself, you know that everything is already fine. Everything that has ever happened was supposed to. The question is...are you learning? Are you enjoying the ride? Today's teaching is all on the Playsheet. Today is a really fun process that I do when I'm wanting to stretch beyond the norm. I want you to really open up here. To explore desires..and then some. We have a tendency to want to think things "should" be more complicated..or fancier...or...something.